An undercover officer can be unmasked at any point in their deployment. It is one of their biggest fears. Even the possibility of being exposed can spell the end of their covert operation. Police have admitted this is what happened to one of their spies who had been sent to infiltrate leftwing groups. The spy had adopted the false identity of “Rick Gibson” in 1974 when he started infiltrating the Troops Out Movement, which campaigned for British troops to be withdrawn from Ireland. He appears to have risen up the ranks of the campaign in quite a short time. This document from the campaign’s archives seems to record his post within the group as “secretariat convenor”. He had access to a list of members of the campaign and their addresses, according to activists. A document written by Gibson when he was undercover. Gibson moved on to infiltrate Big Flame, a revolutionary group of socialists and feminists, but came unstuck. An account of what happened was recorded in 2002 by Richard Chessum, a leftwing activist whom Gibson had befriended during his undercover deployment. It appears that activists in Big Flame were puzzled that Gibson had joined the Troops Out Movement even though he had none of the political past that its activists normally had. Nor did he have any of the usual connections to Ireland such as ancestry. The suspicious activists started to delve into his purported background and discovered that little of it checked out. For instance, the school he claimed to have attended had no record of him. The most significant discovery, however, came from the official archives of birth and death certificates. They knew the date of birth that Gibson was claiming was his. They found a birth certificate that seemed to bear that out. But the activists had also uncovered a death certificate that recorded that the individual that Gibson was purporting to be had died as a boy. The activists confronted Gibson and he disappeared soon afterwards. Gibson apparently claimed he was hiding his true identity because he was on the run from the police. The confrontation was reported by the Guardian journalists Nick Davies and Ian Black in a 1984 series about state surveillance. The Guardian article from 18 April 1984 reporting the confrontation with Gibson. There had been suspicions about Gibson, but not enough proof to show definitively that he was an infiltrator employed by the state. Confirmation arrived in August this year in Metropolitan police documents published by the public inquiry that is examining undercover policing since 1968. Police admitted in the documents that Gibson had been an undercover officer whose operation had been cut short after he was rumbled in 1976. Although they did not know it at the time, the activists had stumbled upon a key technique used by undercover officers to conceal their true identities. For years, the spies stole the identities of dead children and created aliases based on details of the children and their families. The spies were issued with identity records (such as driving licences and passports) in the fake names to make their disguise more credible. This technique was routinely used by undercover officers who infiltrated political groups for years from the 1970s, according to an official police report. What happened to Gibson exposes one of the main flaws in this piece of tradecraft. Activists investigating a suspected infiltrator could check their date of birth and find the birth certificate of what appears to be a real person. But the police spy would be in trouble if the activities continued trawling the archives and found a death certificate showing that the suspected infiltrator was supposed to have died as a young child. It appears that police calculated that the activists would not take that next crucial step, either because they did not think of it, or because the search through the archives was too laborious. At least 144 undercover officers gathered information on more than 1,000 political groups from 1968 onwards. It is not known how many of them had their operations terminated prematurely because they feared they were about to be exposed. One police document suggests it happened “on a number of occasions”. If the full truth of Gibson’s covert operation had been exposed in 1976, it is likely that it would have led to a political furore and perhaps even threatened the existence of his undercover unit, the Special Demonstration Squad. As it happened, the police’s clandestine operation sending undercover officers to spy on political groups remained enveloped in strict secrecy and continued for many more years before unravelling when another of their spies, Mark Kennedy, was unmasked in 2010. Turkish prosecutors have issued arrest warrants for 360 suspected supporters of cleric Fethullah Gulen in the army, state media reported. Thousands of people have been rounded up in the wake of last year's coup attempt. 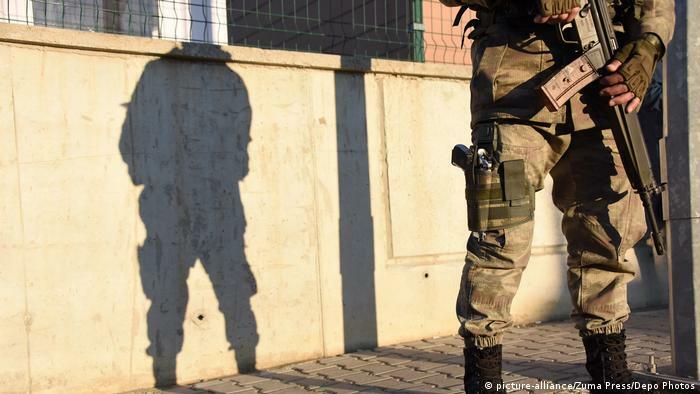 Istanbul police launched an operation on Wednesday to capture 333 more soldiers, most of them on active duty, as well as 27 civilians, Turkey's state-run Anadolu Agency reported. The 360 individuals are suspected of having links to US-based preacher Fethullah Gulen. Turkey's government has claimed the cleric and his network of followers orchestrated last year's failed coup— allegations Gulen denies. The state-run news agency reported that the civilian suspects are accused of acting as so-called "secret imams," who allegedly directed Gulen allies within the military. More than 50,000 people have been jailed pending trial as part of Ankara's massive post-coup purge. An additional 120,000 people have been fired or suspended from the military, police and bureaucracy for suspected ties to the Gulen movement. The crackdown has drawn criticism from rights groups and Turkey's allies in the West, who fear the 2016 coup is being used to justify a campaign to stifle dissent. Turkey says its actions are necessary to counter the threat posed by Gulen's network, which it accuses of creating a "parallel state structure" over decades, infiltrating the military, police, judiciary, media and other institutions. Ankara has urged the United States to extradite Gulen so that he can face trial in Turkey.